Humans are more prepared than ever before to handle a congested inbox, manage crises and personalize experiences for customers at scale. And it’s all thanks to our robot friends. It’s been over a year since we first launched support for Twitter and Facebook private message chatbots at Sprout and we’ve come a long way. We’ve seen over 1,000 chatbots built and deployed in our Bot Builder, received tons of feedback from our customers and spent a lot of time innovating to better compete in the market. But most importantly, we learned a few things. With every new update, we discovered more about what brands really want from chatbots—and how they can better create connection with their audiences through bot interactions. First: Even the most intuitive building experience won’t replace the need for a strategy. Most of the time, brands require a little inspiration to get started. Second: Building a chatbot involves a ton of moving parts, and plenty of stakeholders. An interactive building experience is key—as is collaboration! Third: What good is a chatbot if it’s disconnected from the rest of your social conversations? Without an integrated conservation management system and analytics to measure/optimize, your chatbot won’t last. With these learnings in mind, let’s dive deep into how each lesson has played a key role in helping us continue to drive innovation in Sprout’s Bot Builder —and discover ways to take your bot workflows to the next level. With the growing adoption of chatbots over the last year, we’ve started to uncover why consumers use bots —and more importantly, why not. In fact, the most challenging part of building a chatbot is not the technical aspect; rather, it’s in crafting the content strategy. Many customers are bought in instantly and are excited to create a chatbot—but as soon as they get started, they stare at their blank screen and think: where do I begin? Because of this, we felt it necessary to offer you a starting point. In studying the most common strategies and use cases, we’ve introduced a scalable way for you to easily build and share a preview of a chatbot experience using 1 of 4 pre-made bot templates. Choose either the customer care, marketing, e-commerce or content discovery template—and then quickly customize the messages so the chatbot fits your brand. The templates are pre-built with best practices in mind so you can decrease time to value with each new chatbot you create. Chatbots should aid in the human-to-human interaction, not replace it. Automated conversations are best kept to private channels, where highly personalized experiences can be delivered. 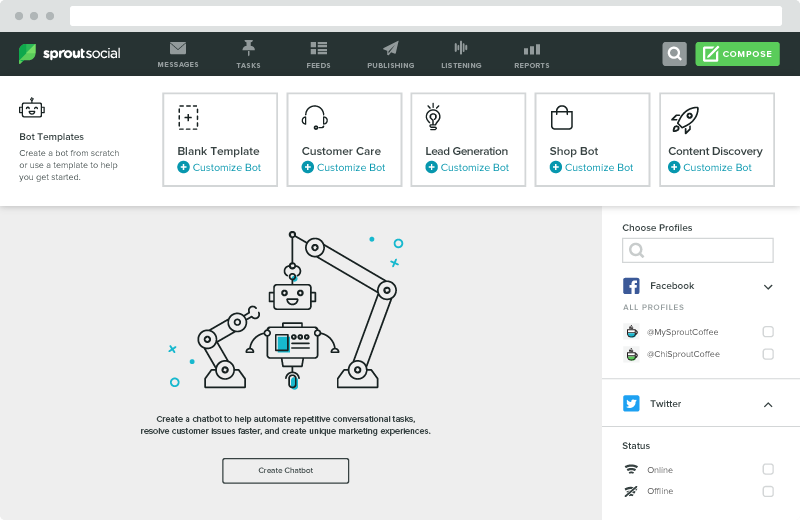 Sprout’s Bot Builder empowers you to develop rules-based bots driven by commonly asked questions, specific themes or upcoming campaigns—all to help you save time and capitalize on more business opportunities happening across Twitter and Facebook. To start, you’ll need to determine what types of conversations you want your chatbot to handle. Using our Conversation Map, you can lay out your options, for example: Shipping, Returns, Promotions, Support. Choose from a variety of message types for different interactions: plain text, images, GIFs or Call-to-Action Buttons. Make your chatbot more intelligent and allow it to cover more bases by setting up responses for specific keyword triggers such as responding when someone replies “help” or “talk to a human”. 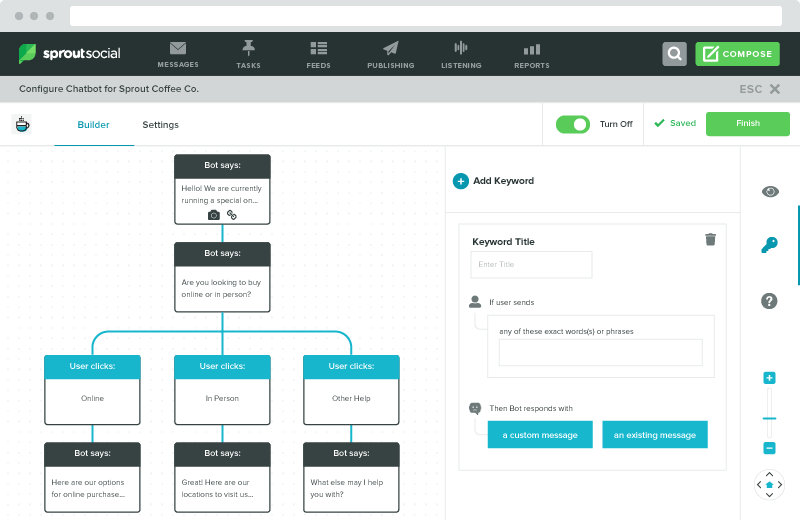 Easily reorganize and visualize your content flows with the interactive Conversation Map where you can drag-and-drop, pan/zoom and even preview the entire experience as you go. In an effort to be more transparent, you can start to humanize the interaction by adding typing indicators, emojis or your own custom avatar. Increase engagement by adding Carousel Cards to Facebook Messenger conversations. Carousel Cards display multiple images, buttons and calls-to-action within a single message and can be used to showcase different product types, for example, to shorten the buying journey and drive traffic to targeted product pages. While one person can build the chatbot, it often requires an entire team to plan, assess and approve a bot experience. Given that a true chatbot conversation is dynamic and interactive by definition—a bit of a choose-your-own-adventure—in order to provide feedback it’s imperative that stakeholders actually experience the workflows themselves. Using Sprout’s external share links, users can more seamlessly collaborate with their team to get buy-in and to get content approved before ever setting a chatbot live. This helps to create alignment for your team and facilitates collaboration from ideation to deployment. Once users start engaging with the chatbot, your inbox can fill up quickly. These messages can crowd your inbox and lead to a lot of dead ends — not only for your customers but for your business. For optimal management, ensure that your chatbot conversations are seamlessly integrated to your existing workflow. This means having the ability to prioritize, triage and respond to chatbot messages from the same platform that you use for all your social media management. Not only does this help to maintain context for ongoing conversations, but it works to establish future relationships. The beauty of the Smart Inbox implies that you also get access to other tools like Tasking and Inbox Views that facilitate collaboration. This is especially important for larger teams who delegate responsibilities and need to uphold certain standards when responding to customers. To deepen this integration, we’ve also identified additional features that are key to your productivity and are specific to chatbot management. To address a high-volume of messages, you can automatically mark chatbot messages as complete to keep them from clogging up your inbox. Used alongside auto-completion, auto-tagging bot messages simplifies the organization of incoming messages in your inbox and incorporates chatbot interactions into your existing tagging strategy. All of these tools combined help streamline chatbot messages so that you can manage conversations more effectively, and ultimately convert bot users into customers. To reach a larger audience, you can create ads that lead users to an engaging experience with your bot. Rather than interrupt them with a traditional ad that’s highly transactional, ads that invite users into a private conversation with your chatbot make for a more dynamic and tailored interaction—one that doesn’t even feel like an ad. Using an Ad ID string generated in Sprout, you can easily plug your unique bot workflow into Twitter Direct Message Card Ads or Facebook Click to Messenger Ads. Look at this recent case study with Samsung, for example. They were able to deliver personalized TV recommendations, increase engagement on their website and generate leads at a quarter of the typical cost with a private message ad supported by a chatbot. This makes it clear that chatbots have the ability to impact more than just the automated interaction itself. A fully integrated social inbox would not be complete without the ability to track performance. 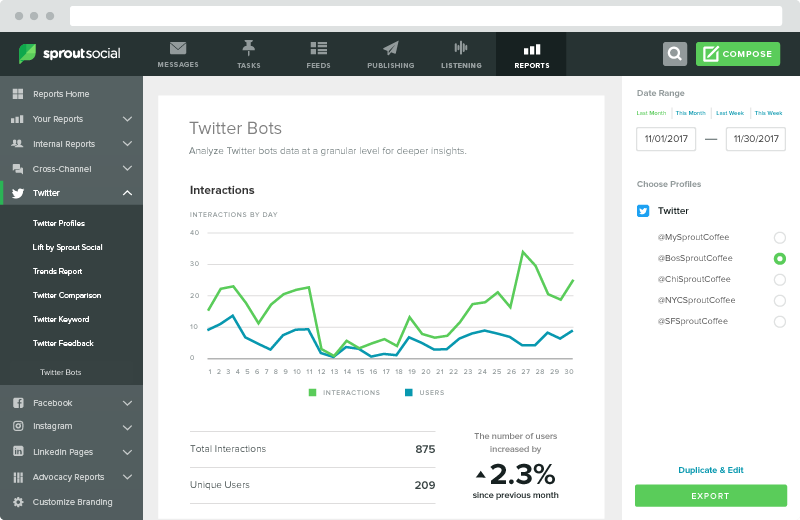 Within Sprout, users can leverage reports for Twitter and Facebook bots to measure bot message and conversation volume, performance, most engaged topics and frequently received user inputs that fall outside of your bot workflow. You can even go so far as determining drop off and conversion rates as interactions advance. With access to data on volume and performance, it’s possible for businesses to gauge where users are finding the most value out of their bot experience and determine where they should be making updates. For example, if you learn that “How-To Tips” is the most clicked reply and that the other replies haven’t been clicked in the last month, you can adjust your content strategy to revolve fully around How-to Tips. The bot report is also a great way to gain insight on user preferences and can help to inform overall business strategy. You should be using your chatbot as a way to collect information from customers to better understand their needs — and then adjust your strategy to accommodate. With automation at the core of your social strategy, you will start to uncover more and more ways chatbots can be used to scale 1:1 interactions. Want to speak with someone on our team to learn how chatbots could benefit your team? Request a demo now. If you prefer to dive right in, sign up for a free trial to start building your first bot today.